I’ve kind of got my sewing mojo back. 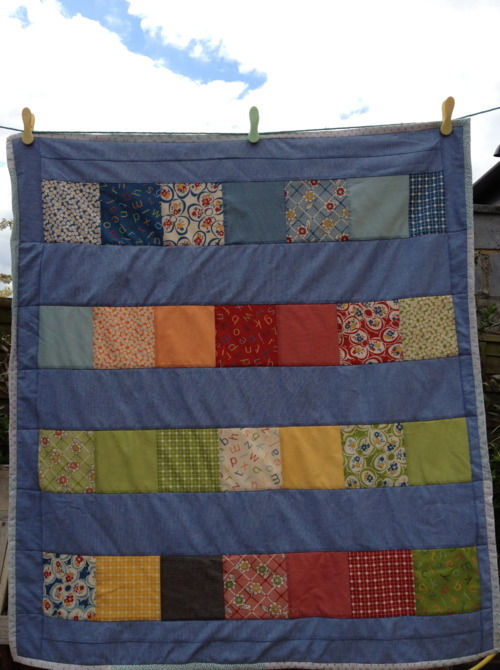 Well, I finished a project – I started this ages ago (to “get ahead of myself” and then didn’t get around to quilting and binding it until the day it was to be handed over. It’s backed with a fleece blanket from that Swedish retailer – which, in full baby brain mode, is white – what was I thinking? It was a good way to use a charm pack although I”m still unsure of that black square at the bottom, and some Marsha McCloskey “More Fat 8ths and Friends” which I’ve been hoarding for ever. It has four coordinating prints running lengthwise along the yardage so you’re supposed to cut it up into eighths but I never got around to it. I reacquainted myself with Heather Bailey’s brilliant continuous binding tutorial and powered through attaching it to the front. Then sat down to hand sew the binding to the back. I’d completely forgotten how meditative and calming it is to make those tiny stitches, over and over.